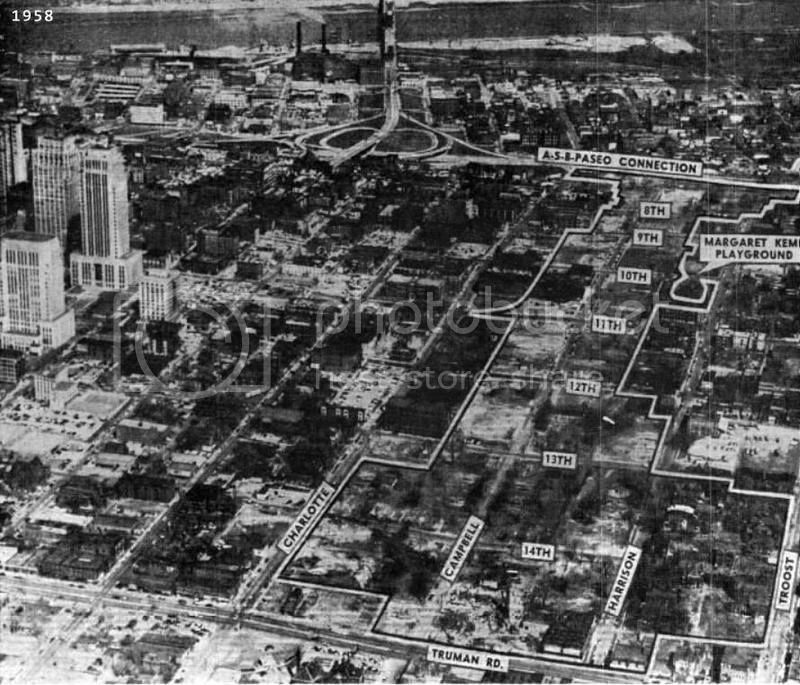 Photo from 1958 shows the area on the east side of downtown being cleared for interstate construction. Is this part of Ike's agenda during his presidency? Is he thinking of something similar to the Autobahn is Germany? "The Bureau of Public Roads asked the Army to provide a list of roads that it considered necessary for national defense. In 1922, General John J. Pershing, former head of the American Expeditionary Force in Europe during the war, complied by submitting a detailed network of 20,000 miles (32,000 km) of interconnected primary highways—the so-called Pershing Map." "The Interstate Highway System gained a champion in President Dwight D. Eisenhower, who was influenced by his experiences as a young Army officer crossing the country in the 1919 Army Convoy on the Lincoln Highway, the first road across America. Eisenhower gained an appreciation of the Reichsautobahn system, the first "national" implementation of modern Germany's Autobahn network, as a necessary component of a national defense system while he was serving as Supreme Commander of the Allied forces in Europe during World War II. He recognized that the proposed system would also provide key ground transport routes for military supplies and troop deployments in case of an emergency or foreign invasion." "The Interstate Highway System was authorized on June 29, 1956 by the Federal Aid Highway Act of 1956, popularly known as the National Interstate and Defense Highways Act of 1956." Last edited by pash on Tue Feb 14, 2017 7:19 pm, edited 1 time in total. pash wrote: Eisenhower wanted to create a system of long-distance highways, but did not support building them through cities. Apparently he did not realize that the bill he signed into law creating the interstate highway system would do that. At that time highways did go through cities. Look at where 24, 40, and 50 go through town. Throw in 69 and 71 for good measure. They might not have been modern highways but out in the countryside they were two lane highways that became 4 or 6 lanes in town. You purchased those at a gas station recently? missingkc wrote: You purchased those at a gas station recently? 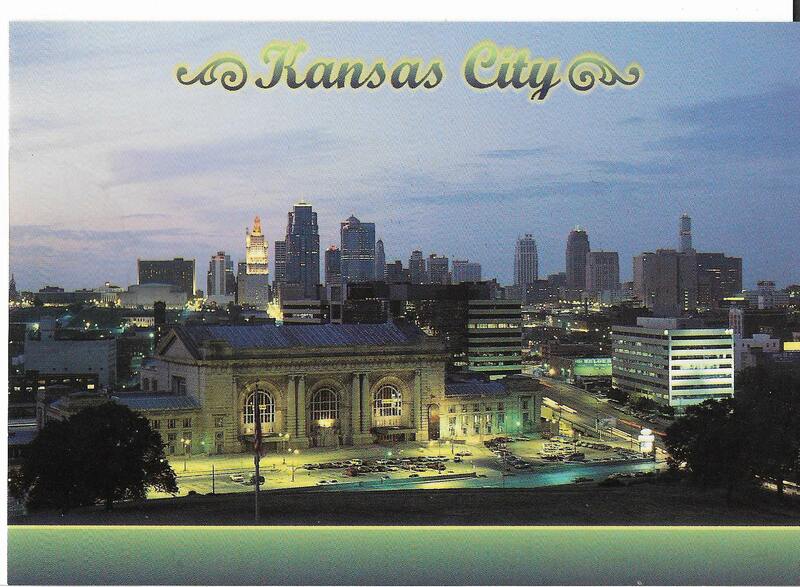 On the first postcard note the grassy field where now stands Bartle Hall, Barnes Ballroom and the KCPA. The tiny Hereford bldng where Loews is now going up stands out clearly amidst the nothingness. 1201 Walnut being missing gives an immediate upper end of 1991. While looking at a historic register nomination form for Garment District buildings, I came across this photo that I had never seen before. 917-921 Broadway before and after demolition. Those retail stores would be handy now in creating more restaurants along Broadway. 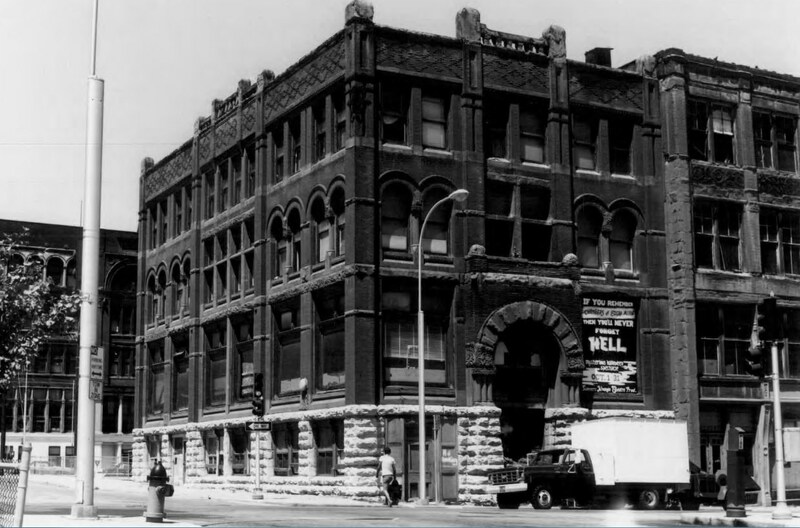 This is the Missouri, Kansas & Texas Trust Building at 622-624 Wyandotte. To the right is the Syndicate Building at 616-618 Wyandotte. 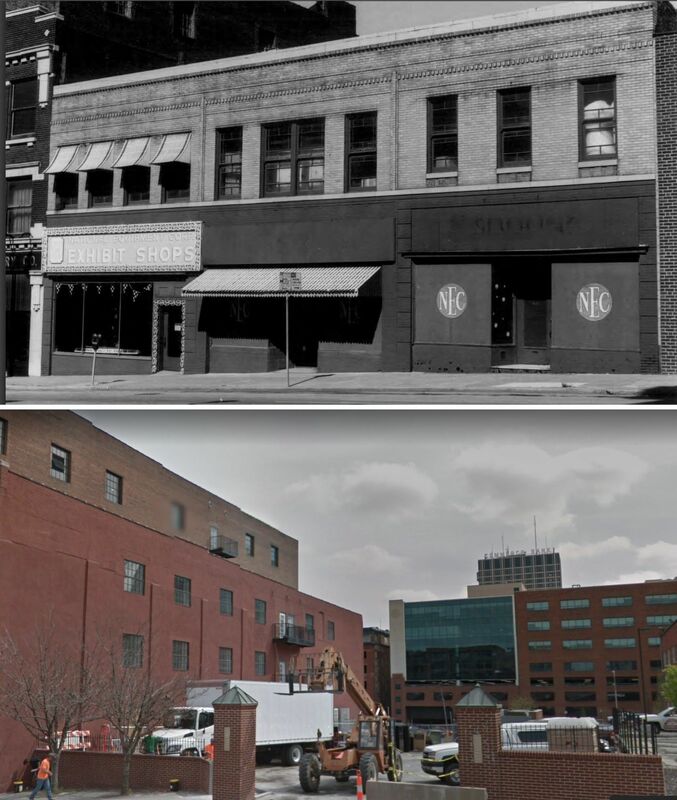 It's easy to think the stuff demolished during urban renewal was just a bunch of junky 2 story brick storefronts or whatever, but in reality there were many legitimate pieces of architecture that just got bulldozed for parking. 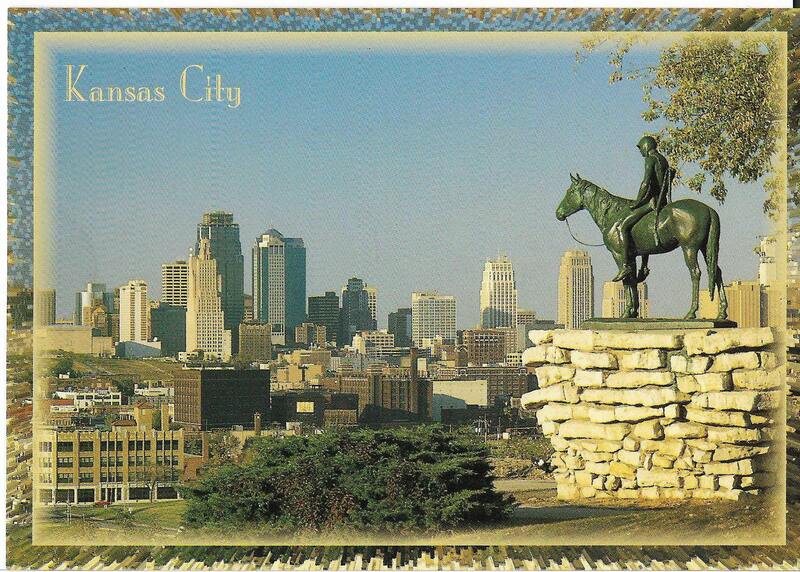 What a beautiful neighborhood it would be if it all had somehow survived. If I had a bottomless pool of money, I'd have all these buildings replicated. 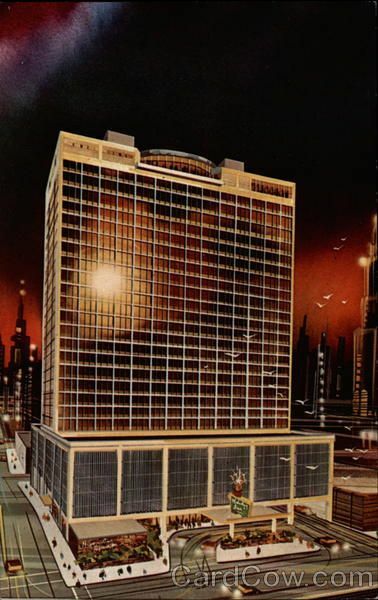 Bizarre image of the crown plaza as....blade runner? These images were posted on a Facebook group. I don't think I've ever seen these photos, so I'm sharing them. 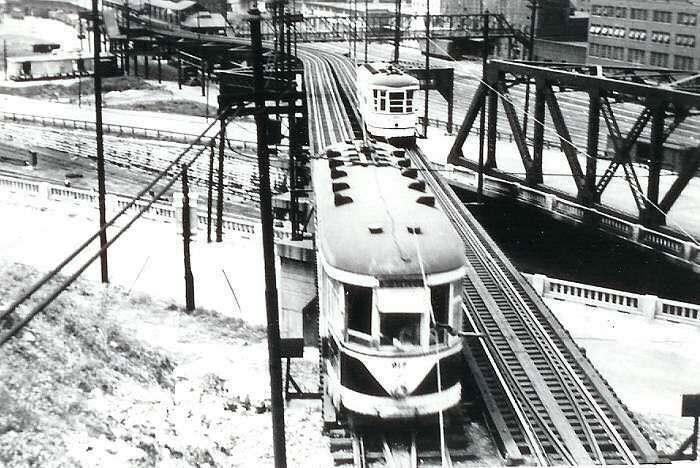 Streetcar coming out of the 8th Street tunnel. 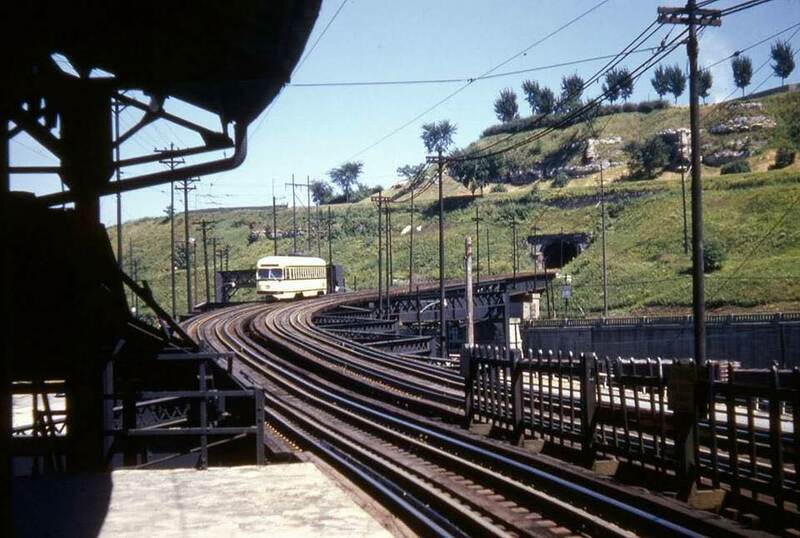 Two streetcars just outside the west tunnel entrance. I've never seen a photo of the City Hall building in the City Market being dismantled. This link shows one. It is heartbreaking. You can click on the photo and zoom in. Fang, there's another pic or two on the library's website of the City Market and City Hall being demoed. 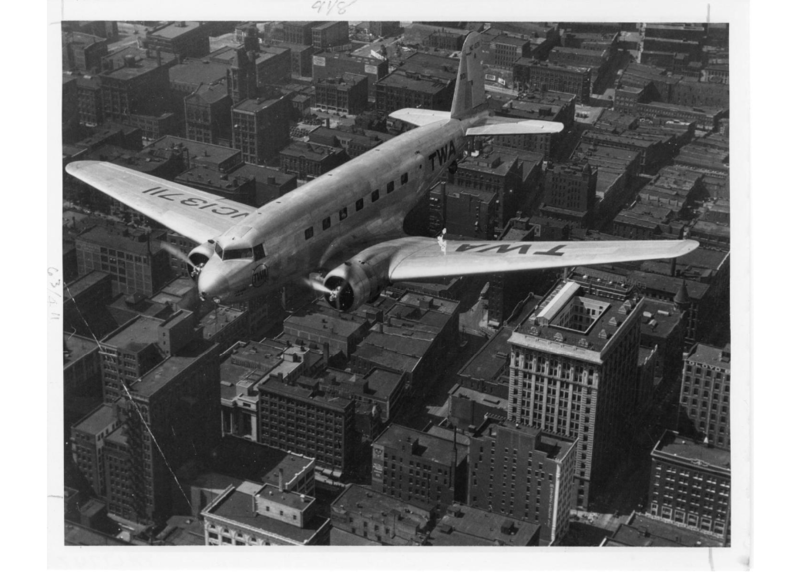 A TWA DC-10 flying over downtown. 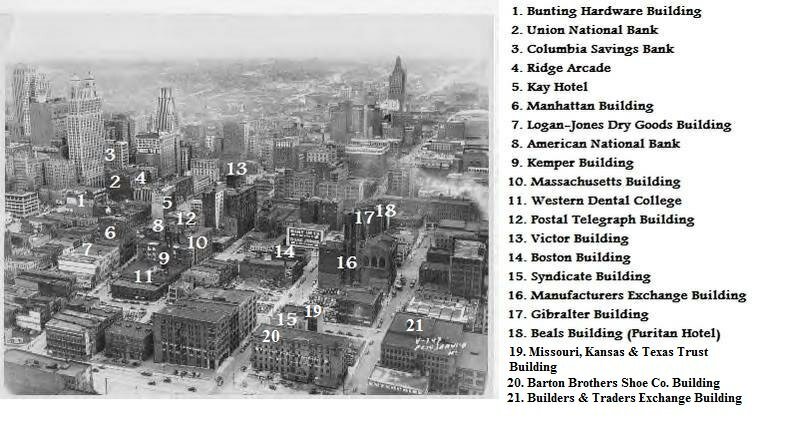 Look at the building density. Probably 1940s.